The year and a half wait is finally over for American fans as Swedish heavy metal band Sister Sin have made their way back to North America to unleash a dose of heavy metal fury upon the masses. Beginning tomorrow, (Friday 1st February) in Tampa, Florida they will tour alongside Doro as they blaze through nineteen cities before beginning a series of headlining dates on February 24th in Las Vegas. Full tour dates can be found at this location. Ready to electrify audiences with their energetic and powerful stage performance, vocalist Liv Jagrell talks about touring with her idol exclusively on the Victory Records YouTube channel. The video can be found at this location. Their recent album Now and Forever is available at Victory Records’ webstore and through iTunes and Amazon. Hypocrisy, the monsters of Swedish Death Metal, have just confirmed and are happy to announce more tour dates for 2013. The official release shows for their new album End Of Disclosure are going to take place on March 22nd in Stockholm at Klubben and March 23rd in Göteborg at Brew House, before the band make their way back to UK shores in April. The band has also posted a tour trailer for the upcoming European tour, which you can check out below. The new album End Of Disclosure will be released March 25, 2013 via Nuclear Blast. The UK leg of Korpiklaani’s European tour, in support of their new album Manala, kicks off tonight in Norwich at the OPEN Concert Venue. The band are being supported by Metsatoll on the full European tour, with local support at the Glasgow (Morlich) and Manchester (Andraste) shows. Cortland Runyon, the man behind the Viking metal solo project Northsong, recently that he’s finished writing the lyrics for the upcoming Northsong release. He also stated that he will begin vocal recording next week. The Final Journey is set to be released through Warhorns Records in late February or March and will be available both physically and digitally. Cortland’s full announcement can be read at this location. Scottish power trio Storm of Embers are hot on the tail of the release of their new EP, I. With a string of shows coming up throughout the year, Nico grabs Storm of Embers bassist Stuart McLeod for a chat. Nico: What’s the meaning behind the band’s name, Storm of Embers? Stuart: When Al and I were coming up with the band name we wanted it to represent the musical ideas we had in mind and nearly all of the other names we were kicking around didn’t seem to suit the music. In our last band the music was very much thrash metal, so the name of that band kind of reflected that. To us, Storm of Embers suits our music perfectly. We don’t really have a meaning behind it, but if you listen to the music then it seems to be the only way to describe what we do. Nico: Storm of Embers recently released the EP; I. What are the main themes that run through the EP? Stuart: The main themes with the I EP, aside from giving a glimpse at what we are all about, lyrically speaking the main themes are life, change and the trials one goes through. Musically speaking this comes over as sometimes rather melancholic but with moments of, we like to think, beauty in amongst the melody and metal elements. Already we are working on the rest of the material for the upcoming full length release and it’s taking a pretty dark shape! Nico: Describe Storm of Embers sound in five words or less. Stuart: Dark, melodic, progressive music. Nico: Are there any bands you’d like to recommend to our readers? Stuart: Rather than recommend individual bands, we would like to encourage everyone to check out a new movement in Scottish music. There are so many amazing bands coming from Scotland we would be here all day if I were to try and name them all! We are part of the Hollow Earth Collective. This is a group of musicians and fans who are interested in all music progressive, post and experimental. Already there are plans for setting up a Hollow Earth Collective tour, I strongly recommend people to check this group out and listen to the bands, there are so many talented musicians and bands in Scotland, so that alone is a reason to check out any band from Scotland! Nico: Where do you think the band will be in five years? Stuart: In five years my hope for the band is to be working with a label to help further our career and help us get the music to as many people as possible. We are in this for the love of it, but having a 400 million pound contract wouldn’t be a bad thing. Nico: When it comes to writing new material, where does the band draw inspiration from? Stuart: Inspiration behind our music really depends on whoever the main writer of that particular song is. For me, when I write a song usually all it takes is an idea for a melody or feeling, then let the song write itself. Al is very much the lyric man of the band. So I present the music to the guys and we then flesh it out in funereal and develop the song into what it wants to be, and Al puts a message behind the song with his lyrics. So what may inspire the music may not necessarily be the same feeling that inspires the lyrics. Other times we jam riffs or melodies out in the studio and write it as a band jamming things out. I usually get nervous when Al comes in with songs as it usually means playing some sort of crazy riff in an even crazier time signature! But it’s all good, at the end of the day it doesn’t matter who wrote what because once the three of us start playing, it’s Storm of Embers. Nico: As the Scottish metal scene in rarely spoke of, let alone mentioned much by the press, outside of Scotland, what can you tell us about the Scottish metal scene? Stuart: The Scottish metal scene is great! There are so many amazing bands, so many different styles. You can pretty much find a metal gig any night of the week, especially in Glasgow where we are from. All scenes have their good and bad points, but overall its good. Again I urge you to check out the Hollow Earth Collective. Stuart: To your readers all I can say a massive thank you for the support, it means the world to us for people to check us out, or buy our merch or come to our shows, and above all else enjoy the music and we hope to play near you soon! Stay inspired, support underground music because that’s where its at! You can check out Storm of Embers at this location. Holland’s best kept secret will today reveal exciting news as The Charm The Fury have announced joining forces with both Listenable Records, which is home to bands like Sarah Jezebel Deva, Betraying the Martyrs and Gorod, and Pavement Entertainment on two record deals that will see their next album released worldwide to fans who are highly anticipating the album’s release. The metalcore quintet not only offer something creatively different with their female screamer but a collection of high energy anthems that have hooked the industry with full effect with their monstrous sound. The band’s debut release The Social Meltdown saw a frenzy of hype surround The Charm The Fury with extensive coverage across National Radio including BBC Radio One and in Europe’s acclaimed Music Magazines including Metal Hammer and Kerrang. 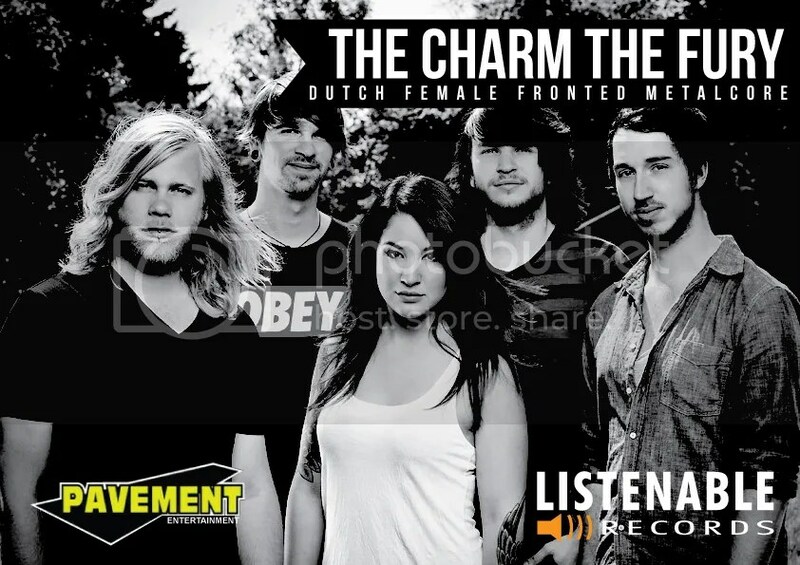 The Charm The Fury have already graced stages with well known names such as I Killed The Prom Queen, Oh Sleeper and Textures during 2012, and a memorable performance at Groezrock Festival on top of those, that raised the bar and offered the band a greater platform to reach new fans. Already nailing support tours and shows across mainland Europe and the UK, it’s no surprise that the Dutch quintet are rapidly progressing as one of the industries hottest new artists. The Dutch collective are in the process of nailing down the last parts of the forthcoming full length album which is set be on shelves and available across the continents by autumn, later this year, and promises to deliver further progression in not only sound and maturity but within the boundaries that continue to be pushed further and further. The new full length will include some very special guest vocal appearances and track after track that will grab you by the throat and leave you begging for more. Caroline Westendorp, the band’s lead vocalist adds: "It is so exciting to see how fast the band has grown in such a short space of time, reactions have been so positive and it is great to welcome the two labels on board and make the next release a real big deal across seas. You can expect some cool surprises in the new record and we cannot wait to show the fans what we have in store for them."